Stroboscopic flash is when a series of flashes are fired continuously in a single exposure. The multiple bursts of light allow you to freeze a moving subject multiple times as it moves through the frame. The results are very similar to that of combining multiple exposures. This tutorial is a brief overview of how stroboscopic flash works. How Do I Access Stroboscopic Flash? 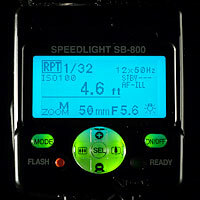 Many of today’s high-end Speedlights such as the Canon 580EX/EX II and Nikon SB-800/900 have this feature built in. Canon refers to this feature as Multi Mode while Nikon calls it Repeating Flash (RPT). We’ll be using a Nikon SB-800 for this tutorial, but all of these concepts can be applied to any flash with a stroboscopic mode. Stroboscopic flash is first controlled by the flash output, frequency, and number of frames. First, you set the power level of your flash just as you would in manual mode. Frequency, expressed in Hz, represents the number of flashes per second. The number of flashes represents exactly how many times your flash will fire at a given frequency. Keep in mind, the lower the output, the more flashes you can get at a given frequency. Once you have your output, frequency, and number of flashes set, you’ll need to set the exposure. You can determine the aperture by using a light meter, using the guide number table in your flash’s manual (f/stop = Guide number x ISO factor / Subject Distance), or simply by experimenting. Keep in mind that if you have a portion of the frame overlapping (i.e. still part of the frame), the repeating flash may result in overexposure. For example: If you flash a still subject at 1/2 power two times, your exposure would be almost exactly like flashing that subject once at full power. This generally doesn’t affect moving subjects but is an important thing to consider when setting up your shot and calculating exposure. The minimum shutter speed is determined by dividing the frequency of flashes into the number of flash frames (shutter speed = number of flashes / frequency (Hz)). For example: If your number of flashes per frame was 10 and the frequency is 5Hz, you would need a shutter speed of 2 seconds or slower. You can also use the bulb exposure if you are trying to time a particular action. 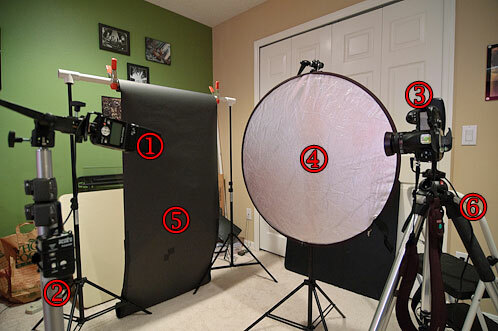 (1) Nikon SB-800 Speedlight (2) PocketWizard Plus II Transceiver with PC-sync connection (3) Camera with shutter release attached (4) Reflector on other side of “drop area” for fill (5) Black background (6) Step ladder to drop subject from. You might have to do a lot of experimenting to get the results that you want, but stroboscopic flash can be a lot of fun. Hopefully the provided frequency, number of flashes, and power settings will give you a starting point. There are also ways of achieving the same effect using traditional strobes or speedlights without a stroboscopic mode. You can always open the shutter and manually trigger the flash as many times as you’d like. Triggering systems like the PocketWizard Multimax transceivers feature a mode called multipop that allows a flash to trigger multiple times within an exposure. There are also infrared and sound triggers available for high speed photography. These devices fire your flash when a particular action happens and can be a lot of fun to experiment with.